Ischia Porto seen from above. Photo by Fausto Barbetta. A one-week school intended for PhD students, postdocs and young researchers. 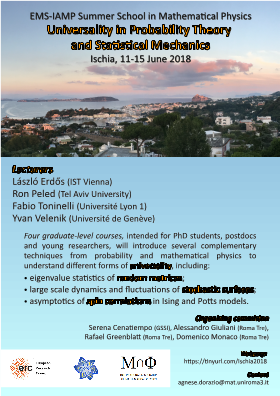 The four advanced graduate-level courses will introduce the mathematical methodologies used to understand different forms of universality - from eigenvalue statistics of random matrices, to the large scale dynamics and fluctuations of stochastic surfaces, to asymptotics of spin correlations in Ising and Potts models - in a complementary fashion.